Hourly workers at Cadence Aerospace-Giddens in Everett, WA voted by a 3-to-2 margin to join IAM District 751. The IAM Western Territory racked up several organizing victories in the last week of May, bringing in a total of 329 new members and raising the territory’s organizing success rate to 89 percent. Western Territory General Vice President Gary Allen expressed his great appreciation for the hard work and activity underway in the territory. Among the wins are 224 workers at Cadence Aerospace-Giddens who voted to join Seattle District 751. Workers at the company’s two Everett, WA plants produce precision machined aerospace components, subassemblies and kits, and do sheet-metal forming. District 160 welcomed new members at Western Pneumatic Tube in Kirkland, WA who voted unanimously for IAM representation. 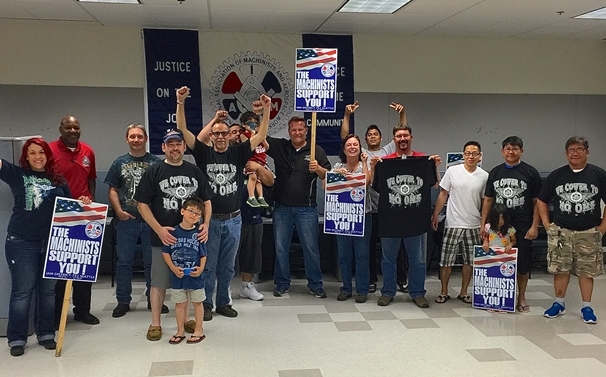 On May 27, the L3 unit at Moffett Field in San Jose, CA voted overwhelming to join IAM District 725. The workers ignored visits by Corporate HR and multiple company letters to their homes and sent a strong message to L3 that they want the IAM and they will not accept business as usual. “We are very excited for Local 2228, this is their first organizing victory in more than 10 years and the first of more to come,” said District 725 Directing Business Representative Larry Olinger. IAM Local 845 gained a recognition agreement for the AOC group at Creech Air Force Base in Las Vegas. The unit is a support group for Battlespace and includes Quality Control, Production Control, and Supply Technicians.